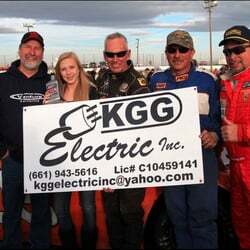 KGG Electric is owned and operated by Kenneth and Pamela Gardner. Kenny started the business in 1984 and Pam joined him in 1986. Together they have been running the business successfully for 27 years in the Antelope Valley and surrounding areas. KGG Electric specializes in electrical construction, design build and service work, providing labor, equipment and material to install interior and exterior electrical construction, including site lighting systems, CCTV systems, fire alarm, security and access control systems, and underground utility work for residential, commercial and industrial applications. KGG Electric's scope of services include, but are not limited to, complete installation of low, medium, and high-voltage electrical systems including single-phase through three-phase ac/dc power distribution systems, interior and exterior electrical wiring systems, electrical site development, underground electrical utility installation, rough and finish electrical, customer service including troubleshooting and repairs and installation of CCTV, computer and fire alarm systems. Some of the electrical projects completed include senior housing complexes, retail and professional tenant improvements, site development, restaurants, medical facilities, power generation systems, demolition, government facilities, underground utility work, troubleshooting and 24/7 customer service work.